Katherine Arden burst onto the fantasy scene with 2017’s The Bear and the Nightingale, book one of The Winternight trilogy. Set in fourteenth century Russia, the novel introduced Vasya Petrovna, a young girl with the ability to see spirits which live amongst her house and the surrounding village. Two of these mythical beings are the the winter demon, Morozko, and his brother, Medved, a bear who wishes to destroy and cause chaos in the world. With the help of Morozko, Vasya banishes Medved and foils his plans before riding off on horseback to explore the world. Arden’s sequel, 2018’s The Girl in the Tower, follows Vasya toward Moscow and a reunion with two of her older siblings, Olga and Sasha, who, as the wife of a prince and as a monk serving under their cousin, the Grand Prince of Moscow, are both wrapped up in the politics of the day. 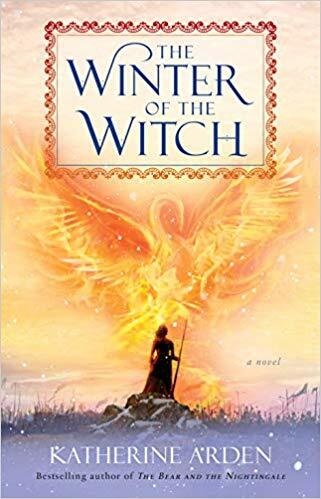 2019 brings the conclusion of the trilogy with The Winter of the Witch. The story picks up immediately where The Girl in the Tower left off, with Moscow burning after an attack from foreign invaders. Arden expands on the forest setting of The Bear and the Nightingale and the big city feel of The Girl in the Tower by allowing Vasya, accused of being a witch by locals, to escape to the spirit world, the land of Midnight. Where The Bear and the Nightingale felt more like a fairy tale, and The Girl in the Tower was more of a political, historical story, The Winter of the Witch manages to blend both the political intrigue of the second novel and whimsical nature of the first. Upon entering Midnight, Vasya encounters other creatures, such as Ded Grib, a spirit living within a mushroom and a bit of comic relief. Traveling between the mortal world and this world of magic, Vasya must bring together friends and enemies, both human and supernatural, to face off against the invading army from the prior entry. Arden’s writing continues to be as beautiful and as lyrical as it was in the first two volumes. It is quite easy to lose oneself and be whisked away to these locations from centuries ago. Intriguing is the fact that many of the characters, both human and non-human, are based on actual historical figures or legitimate Russian folklore - Arden is a student of Russian history, and it shows throughout this series. Near the conclusion of the novel is a conflict at Kulikovo. It is based on the actual Battle of Kulikovo, a 1380 victory for Moscow which, according to many historians, serves as a major turning point in Russian history regarding the formation of modern Russia. ‘In the priest’s soul was a desperate mourning. I prayed - all the years of my life, I prayed. But you were silent, Lord. If I am making bargains with devils it is only because you abandoned me. This devil looked as though he were following his thought with an easy and secret delight. “I want to forget myself in men’s devotion.” It was the first time he had ever spoken the thought aloud. “I want earthly authority,” Konstantin said. With The Winternight trilogy, Arden has mixed the genres of fantasy and historical fiction to create a tale that will make readers want to learn more about the true events of this period of history. She has set a high-bar mark for folkloric fantasy. —Michael Feeney is a book reviewer and pop culture junkie from the Philadelphia area. He is an avid reader of fantasy and science fiction.